Update: Pebble Time is now officially the most funded project in Kickstarter history. For Pebble, last week belonged to its new smartwatch. Pebble Time debuted on Kickstarter just seven days ago and became the fastest Kickstarter project to raise $1 million. Now with well over $12 million in pledges and 24 days remaining, the Pebble team has unveiled a new variant of its latest smartwatch called Pebble Time Steel. This new model includes all of the features of Pebble Time but comes in a CNC-finished 316L stainless steel casing in your choice of silver, black or gold. It’ll arrive with a stainless steel strap as well as a premium leather strap but best yet, battery life has been boosted to a whopping 10 days (the casing is a bit thicker). Pebble Time Steel is being made available through the same Kickstarter as the existing campaign. Current Pebble Time backers can upgrade to or add a Pebble Time Steel by clicking the blue “Manage” button that appears next to their pledge amount (simply select the combo tier when doing so). All reward watches will be engraved with “Kickstarter Edition” and those who are backing Pebble for a second time on Kickstarter will receive an extra special engraving. Interested parties can reserve a Pebble Time Steel for $250 although as of writing, nearly half of the 10,000 allotment at this price have already been spoken for. Pebble is clearly on a roll here and showing no signs of slowing down. The campaign is less than a million bucks away from becoming the most funded of all-time. The watches will ship separately so buyers won’t have to wait. 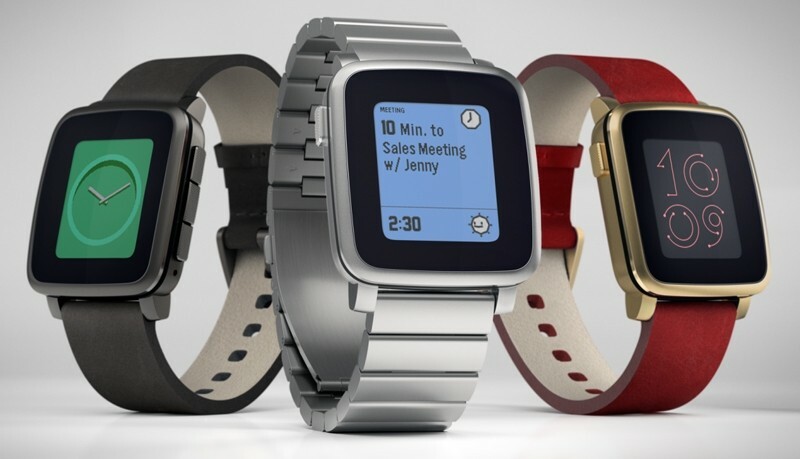 Pebble Time is expected to arrive at backers' doorsteps in June of this year followed by Pebble Time Steel in July. Pebble also detailed a new product category called smartstraps. These straps will enhance and expand the functionality of Pebble Time and Pebble Time Steel in a variety of ways. Examples include, but aren’t limited to, adding GPS and NFC sensors, enabling fitness tracking or even serving as an ancillary battery pack. The company has released a developer preview which consists of the mechanical and electrical designs to allow developers to start working on smartstraps. The APIs, however, won’t be available until several months after Pebble Time ships so don’t expect any added functionality in the near future.